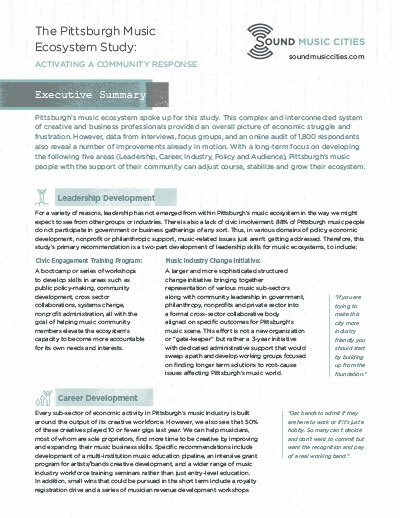 Sound Music Cities was excited to release The Pittsburgh Music Ecosystem Study last month. This body of work captures the state of Pittsburgh’s local music industry – and outlines a robust action plan that will propel musicians, music businesses and others stakeholders to the next level. Sound Music Cities thanks 91.3 WYEP, The City of Pittsburgh Office of Nighttime Economy and Pittsburgh Downtown Partnership for coming together to spearhead this project. The project was made possible with support from The Heinz Endowments and Henry L. Hillman Foundation. The 10-month journey paid particular mind to capturing the voices of all stakeholders – through the course of interviews, a town hall meeting and online survey with 1,800+ respondents from the community, including musicians, leaders and business owners. The Pittsburgh Music Ecosystem study explores themes around Leadership Development, Career Development, Regulatory Reform, Industry Development and Audience Development, providing a blueprint of clear recommendations in each area. Perhaps one of the greatest strengths of Sound Music Cities’ approach, the study provides a truthful lens into both the challenges and optimism of Pittsburgh, addressing the unique needs of the local community and providing a tailored plan to build up the music economy – one sensitive to the needs of all stakeholders – for years to come. Visit www.pghmusicproject.org to read more about the study, or view the report by clicking on the links below.